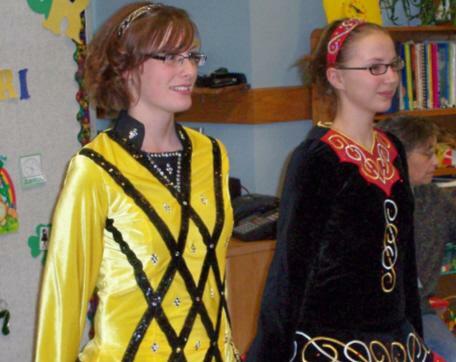 Fulton Public Library Children’s Story Hour was pleased to have Jill and Jacki O’Brien, from the Butler-Sheehan Academy of Irish Dance. They demonstrated some different Irish step dances. Their mother, Jane, gave some explanations on the dresses and shoes that are worn. She also explained the different levels that can be achieved by a step dancer. Jacki has been dancing for almost eight years and Jill has been dancing for twelve years. The children and adults at Story Hour were excited by their performance.